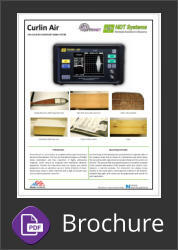 The Curlin Air Non Contact, Air Coupled, Ultrasonic Flaw Detector & Composite Bond Tester. The amazing penetrating power allows the inspection of materials/structures not normally considered testable. The lack of couplant avoids contamination of surface and allows the testing of porous materials. 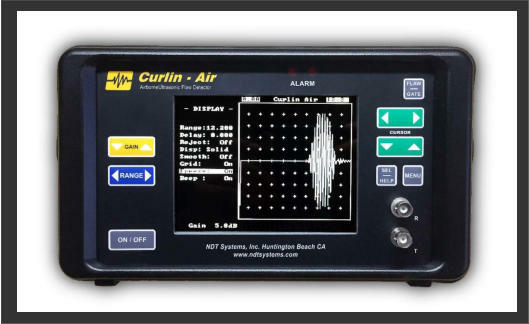 The CURLIN AIR, Airborne Ultrasonic Flaw Detector was initially developed to ultrasonically inspect an ever growing class of materials/products that are too attenuative to inspect with conventional (Megahertz frequency) ultrasonic flaw detectors. However, because of its non-contact airborne beam feature, the CURLIN AIR, Airborne Ultrasonic Flaw Detector, also, offers applications advantages for certain materials/products that are routinely inspected with conventional equipment. Refer to the Application Notes (AN) which are published on an ongoing basis for the CURLIN AIR, Airborne Ultrasonic Flaw Detector. The unique performance of the CURLIN AIR, Airborne Ultrasonic Flaw Detector sometimes may seem amazing, especially to those who have had experience with conventional ultrasonic flaw detectors, as well as those who could not find a practical means to non destructively inspect their particular product. Neglecting actual performance levels/details, it almost becomes an issue of what the CURLIN AIR’s ultrasonic beam can't "punch through", rather than what it can punch through. 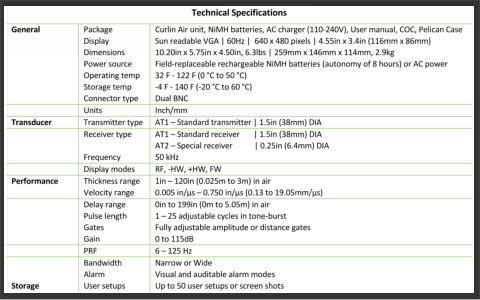 The object of this Technical Note is to briefly explain, in simple and general terms, how & why it works. Features •No Liquid Couplant Needed•No Surface Contact •Portable •Analogue Output for Use With Data Acquisition Systems No "Magic" In order for the CURLIN AIR, Airborne Ultrasonic Flaw Detector to work, the following major technical issues needed to be addressed: Test Frequency: A frequency of 50KHz (having a wavelength in air of 1/4") was chosen because it was: • low enough so ultrasonic attenuation (scatter and absorption) is greatly reduced to levels which permit ultrasound to readily propagate through both air and the categories of materials targeted for inspection, yet • high enough so satisfactorily small-diameter, well-collimated ultrasonic beams can be generated by acceptably small-sized probes (transducers). The 1.9" OD Model ATI Probe has an effective beam diameter of about 1 3/8" at the probe face, with a beam-spread of only about 91/2° (half-angle at - 20dB). Tone Bursts: Generate pulsed ultrasonic energy in the form of rapidly reoccurring tone bursts (cycle packets at the 50KHz test frequency) which possess the necessary duration (pulse length) and amplitude to deliver the desired "penetration power", yet eliminate/minimize standing wave interference. Sensitivity: Provide the high levels of low-noise adjustable amplification needed (up to 100dB or 100,000X) to compensate for the large amount of ultrasonic energy lost by reflection at both material surfaces (airborne ultrasound experiences an exceptionally large acoustic impedance mismatch at air-solid interfaces - far greater than the liquid couplant-solid interfaces experienced with conventional flaw detectors). 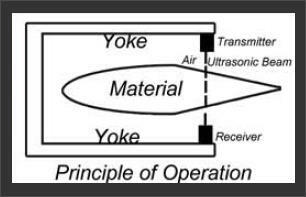 Special Probes (Transducers): Provide exceptionally effective energy coupling to transfer satisfactory levels of ultrasound into and back out of the air. An easy way to initially visualize what's happening ultrasonically and why flaws are detectable is to take a "trek" along with an ultrasonic tone burst (longitudinal wave mode) as it travels from the transmitter probe, through air to the material being inspected, through the material and eventually through air again to the receiver probe.